Gone are the days where you can post a simple snapshot on to your Instagram feed and quickly command comments and likes. The masses have adopted the platform, and the bar has risen, and if you’re using Instagram to try and bolster your business, knowing the unique nuances of Instagram and its community are vital for seeing success in the form of increasing inquiries and bookings for your spa. Sure, a picture of your glass of wine on a Friday night with the hashtag #TGIF might be relatable, but it isn’t going to help connect with your audience in a way that leads to business growth (and being able to afford better wine). In this guide to successful Instagram marketing for estheticians, you’ll learn the four foundational pillars that you need to have in place before posting another picture, video or Story to your profile so that you can ensure you’re stopping your dream clients' scroll and moving them over to your website or booking page. Let’s take a momentary step back from Instagram and establish this: “Why?” is the root question of any and everything you will do with marketing your business. Why do you serve the specific people you serve? Yes, it feels like you’re giving your business the toddler treatment (“But why, mom?”), but if you don’t know the answers to these questions, none of your marketing efforts will cohesively support your business or its goals and objectives. Why do you want to market your spa, and/or yourself as an esthetician, on Instagram? Your audience is on Instagram. According to data from Statista, as of July 2018, 64 percent of Instagram users worldwide are between 18-34 years old with 30 percent of those users being women, and they are primed to buy. Esthetic services lend themselves to be marketed well on Instagram due to their highly visual and results-focused nature. Despite the vastness of Instagram’s user base, Instagram’s localization capabilities make it easy to get in front of people who live directly in your neighborhood and community. Establishing yourself as an authority and expert will drive up your demand, and subsequently, allow you to raise your prices. Whether you want to partake in Instagram marketing to drive more clientele to your brick and mortar spa or clinic, grow your e-commerce revenue, develop influence that leads to educational or promotional opportunities, or a combination of those reasons, you need to specifically know why you’re going to continue putting in the work on this platform. Not only does this help to keep you motivated and consistent, but it underpins your entire Instagram marketing strategy. Newsflash: If you are aiming to boost your bookings for your brick and mortar-based spa or skincare clinic, your ideal audience is not everyone in the closest three zip codes to your business. Whether you’ve been in business for nine months or nine years, you have experienced the client from hell, and you’ve also had a dream client. You may be thinking to yourself that a client is a client, and clients pay the bills, but the truth is, bad clients hurt your bottom line by sucking away your time and energy, which as an entrepreneur are your two most valuable resources. Refer their friends, family members, and others who are in their inner circles who also classify as your dream client. All this to say, someone with money to spend doesn’t make them an ideal client. So, think to that aforementioned dream client you wish you could clone. What are their biggest goals, fears, concerns (as it relates to your esthetic business and life in general)? What do they hate and get annoyed by? What are the biggest drivers behind their purchasing decisions? Listen, I don’t get my lashes lifted and tinted because it makes me feel glamorous, I do it because I have an infant and I haven’t slept for more than four hours straight in over a year, and it looks unprofessional to look like a cast member of The Walking Dead on conference calls. And the college-aged girl looking to manage her acne and the philanthropic soccer mom who has three kids that all go to different schools and wants not to look 40 when she’s only 33 aren’t the same people. If you’re trying to talk to all three of us, none of us are going to hear you, and you’re going to get lost in the sea of noise made up poorly lit food pics, cat memes, and humble brags. But talk to the one single person who is your dream client, they will hear you loud and clear. On top of your ideal client knowing you’re talking to them through your content and messaging, which commands immediate attention, knowing and understanding who your ideal client is also informs how you will deploy your overall Instagram marketing strategy to ensure that your content gets in front of your dream client. Alright, now that you are clear on why you’re going to invest the time and energy into Instagram marketing for your spa, and you know who you’re appealing to by getting clear on your ideal client, you need to take that information and determine the content you’re going to share. Back in my PR and journalism days, the first thing we had to nail before making a pitch or writing an article was getting clear on the angle, or the specific reason why someone should care. If you’re an esthetician, you are licensed to address concerns for anyone with skin, but I don’t have to explain to you that areas of skincare vary greatly. From aging skin, to sun-damaged, acne scarred or hyper-pigmented, you can treat them all, but what’s your specialty? Finding your angle/niche/specialty is what will help you stand apart, and again, it all needs to tie back to your ideal client. What problems and concerns are the most pressing for them to solve first? Nothing says you can’t help someone with aging prevention after you’ve healed their adult acne. But if your dream client is initially coming to you with their acne problem, that’s the primary angle you want to focus on with your content. Learn how to optimize your profile to get found by your dream clients, captivate their attention, and turn their scroll into a scheduled consult and booking. We don't send spam or share your email. Unsubscribe at any time. Yes, Instagram marketing will assist in helping you to stay top-of-mind for your current clientele by remaining a consistent presence in their day-to-day lives, but the real legwork of client retention happens in the experience you create within your spa and through other digital marketing channels. And once you’ve created a loyal client, you can market your services focused on other results and goals through in-person consults and continued client relationship nurturing. Therefore, it is most beneficial that you cater your angle on Instagram (new client attraction and conversion) toward the area of your esthetic expertise that you want to be most known for (your why should address this) and the biggest concern or problem your ideal client is looking to address or solve. Taking an angled approach is what allows you to become the “go-to” person in your locale for your specific services. Next, after finding your angle, you want to determine your content topics. If you’re ever left wondering “what should I post about?” your content topics are the answers to that question. Depending on your ideal client and your specialty, there can absolutely be room for more, but these primary topics cover the bases of what a potential client needs to see to solidify their know, like, and trust factor with you. If you’re not familiar with the “know, like, and trust factor” concept, it’s essentially the crux of a relationship where someone has had enough exposure to your brand and business to know you, has reached a level of comfort to determine they like you and has gained confidence in being able to trust you, which transitions them from being a “consideration” phase of their customer journey to a “purchasing” phase. So, with your why, ideal client, and angle in mind, determine what content topics will resonate in a way that grows and deepens your know, like, and trust factor with your ideal client. Now that you’ve done the majority of the groundwork, it’s finally time to fire up the Instagram app and give your profile a glow-up. Your profile picture - This should answer the question: who is behind the Instagram account? If you’re a solo esthetician, your beautiful face needs to be front and center. If you have a logo, that’s great, but keep it on your website. If you are a spa owner with a multi-person team, that photo can still feature you if you are the primary authority displayed in your content; otherwise, you can opt for a logo (and display faces on your highlight covers). Your bio - The who, what, why, and where of what you do. This isn’t the place to tell your potential clients you’re a dog lover and coffee drinker. You need to display your value and tell someone why you’re worth following and connecting with. Your highlights - Your Instagram Stories need to be organized into relevant highlights that give your potential client the most important need-to-know recaps of your business. It should almost mimic your website in the sense of showcasing info about you/your business, your services, your clients and results, and how someone can work with you. The top 3 to 9 posts on your feed - People go to Instagram to find things that will entertain them, interest them, inform them, and make them look cool and interesting. If your posts don’t appeal to them visually, they’re out, plain and simple. Of course, this is just the tip of the Instagram iceberg, but it’s these four steps that make up the entire foundation of successfully creating and executing a comprehensive Instagram marketing strategy. 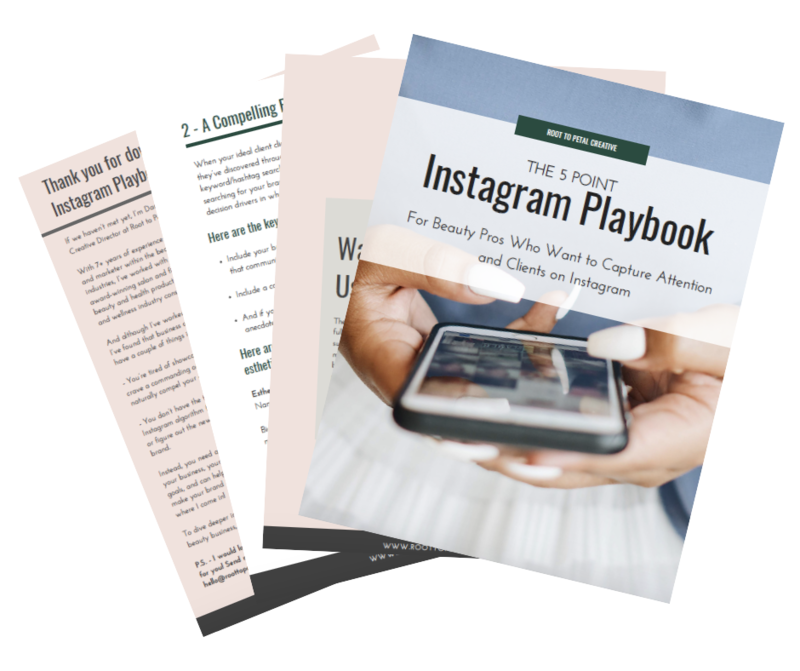 For the next steps for how to optimize your profile’s search-ability, create a compelling bio, and connect the dots between moving a potential client off of your Instagram page and onto your online booking platform, click here to get the free Instagram Playbook for Beauty Pros. Once you’ve implemented all these tips, send us a DM so we can connect with you on Instagram, show your page some love plus give you any additional pointers to help you improve your profile!